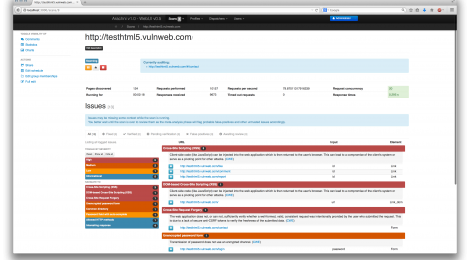 Browse: Home / Arachni – Web Application Security Scanner Framework v1.3.1 released. —–http-ssl-key` — Fixed typo causing option to raise error. Arachni’s license has changed, please see the LICENSE file before working with the project. v1.0 is not backwards compatible. Site authentication (Automated form-based, Cookie-Jar, Basic-Digest, NTLMv1 and others). Automatic log-out detection and re-login during the scan (when the initial login was performed via the autologin or proxy plugins). Hibernation support — Suspend to and restore from disk. With the ability to auto-detect server health and adjust its concurrency automatically. Support for custom default input values, using pairs of patterns (to be matched against input names) and values to be used to fill in matching inputs. #audit_page — Updated to perform DOM/JS/AJAX analysis on the page and feed DOM page snapshots and new paths back to the Framework. #stats renamed to #statistics with the return hash cleaned-up. Added State — Stores and provides access to the system’s state. Plugins — Stores plugin runtime states when suspending. HTTP — Stores client headers and cookies. Audit — Stores audit operations. ElementFilter — Stores seen elements. Framework — Stores the Framework state. RPC — Stores the RPC::Server::Framework state. Added Data — Stores and provides access to the system’s data. Issues — Stores logged Issue objects. Plugins — Stores plugin results. Session — Stores login configuration. Framework — Stores the Framework audit workload. RPC — Stores the RPC::Server::Framework audit workload. Dumps and loads State and Data to and from disk to suspend and restore active scans. The Framework has grown to encompass a process providing the same functionality as a result of Browser analysis. Now passed a single Hash argument with configuration options. Provides an interface similar to traditional elements in order for generic DOM elements to be logged and assigned as vectors to issues. Basing its vector identification and manipulation to a user-provided template to satisfy cases like ModRewrite and similar. Including #dom pointing to a Auditable::DOM object handling browser-based link submissions/audits. Added #dom pointing to a Auditable::DOM object handling browser-based form submissions/audits. Added #dom pointing to a Auditable::DOM object handling browser-based link submissions/audits. Added #dom pointing to a Auditable::DOM object handling browser-based cookie submissions/audits. #audit – Callback now get passed the HTTP response and element mutation instead of response, audit options and mutation — options can now be accessed via the element’s #audit_options attribute. Added DOM — To handle DOM submission/auditing of elements. General refactoring and code cleanup. Updated the algorithm to ensure server responsiveness before each phase. Lowered the amount of performed requests. No longer downloads response bodies. Serializer — Replaced Marshal and YAML as RPC serialization providers. Supports message compression — applied based on message size to minimize overhead. opts handler renamed to options. #dispatch — Returns false when the pool is empty as a signal to check back later. Removed proc from job info data. :messages now returns Framework#status_messages instead of output messages. ProxyServer — Moved the proxy server out of the Proxy plugin and updated it to work with Arachni::HTTP objects. Browser — Real browser driver providing DOM/JS/AJAX support. BrowserCluster — Maintains a pool of Arachni::Browser instances and distributes the analysis workload of multiple resources. Attributes (#links, #forms, #paths etc.) are lazy-parsed on-demand. Page::DOM — Static DOM snapshot as computed by a real browser. Parser — Updated to only operate under the context of the HTTP::Response with which it was initialized — no longer supports parsing data from external sources. Options — Rewritten with renamed option names and grouped relevant options together. #save — Updated to store a compressed Marshal dump of the instance. .load — Updated to load the new #save format. Component::Options — Refactored initializers and API. All updated to the new format. Descriptions have been converted to GitHub-flavored Markdown. Changed results to include status (String) and message (String) instead of code (Integer) and msg (String). Changed results to include status (Symbol) and message (String) instead of code (Integer) and msg (String). Extract partial paths from HTML comments (comments). script – Extract partial paths from scripts. Moved all Framework components (modules, plugins, reports, etc.) under components/. Audit checks renamed to Active checks. Recon checks renamed to Passive checks. Descriptions and remedy_guidance have been converted to GitHub-flavored Markdown. emails – Updated to handle simple ([at] and [dot]) obfuscation. ← skype-osint – Python OSINT Tool to retrieve information from Skype.